Film drum scanning, fluid (formerly oil) mounted with Heidelberg Primescan & Tango PMT scanners. to make large high quality reproductions. and there is a complete lack of digital noise. Exceptional sharpness means less USM being needed later on. mounting, and an exceptional optical quality is achieved. picture information is not compromised. dark, which occurs with scans made using CCD scanners. 35mm right up to film or artwork of 62x49cm in size. and amazing tonal smoothness in all of the colour channels. Film being prepared for scanning using fluid mounting techniques before the drum is placed in one of our PrimeScan drum scanners. 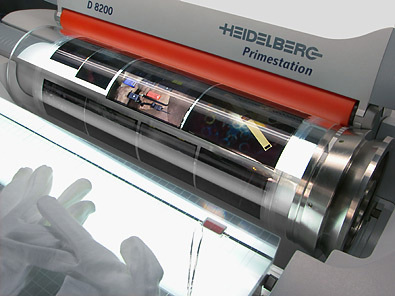 Our scanner drums can accommodate film or flexible flat artwork up to 62x49cm. Maximum resolution available is approx. 11K ppi.